Collaboration has been a bit of a theme this week, having been to the launch of Surrey CC’s new Homelessness service for young people on Tuesday. The launch was held at High Ashurst on the top of Box Hill - a very fine new building that sits well in the countryside up there. This is a superb initiative which locates responsibility for homeless young people with SCC’s Youth Support Service and is based on a collaboration between the County Council, district councils and housing providers. Readers will recall that homelessness was one of the major issues referred to in the “Young Surrey – strategic review 2012/13” on our website (under News). On Monday I had met with Surrey CAB Consortium about collaborating over a grant bid , and on Wednesday was in London for the AGM of our national body NCVYS who were sharing the occasion with two other organisations - LEAP and UK Youth who held their AGMs separately, but simultaneously. Great panel speeches, notably by Dame Julia Cleverdon (ex BitC) and inspirational talk by Tanni Grey-Thompson, paralympian. Good networking including with Oftsted’s HMI Inspector for Youth Services, who I know. NCVYS have negotiated a special relationship with an insurance company Unity Uk with whom we willl be partnering locally to give good insurance rates to our Members. I find such events useful for discerning trends, and am pleased that we are on track and ahead of trends, particularly in building links to business. NCVYS have invited us to write a short piece about achievements to go off to the DfE….. Various funding proposals are coming to a head over the next couple of weeks so we will have to wait patiently (not my strongest suit). Meanwhile, The Challenge Network (Members – delivering National Citizenship Scheme) have undertaken to find young people to organise the Celebration of Youth…the long awaited social enterprise is being registered….we’ve put a proposal to Guildford FE College to link to their students as a virtual reference group, and for them to put forward a student for our Board of Directors. We’ve got the flyer ready to launch the Surrey Youth Enterprise “how to" workshop for young people on self-employment - 24 January…and so on – a very positive week!! I am not even commenting on the rugby this time (against the All Blacks). Question is - are England learning/improving? I think the answer is yes. Advent Sunday..says something about Christmas coming up! Those of you who have long experience of working, know that it is near impossible to avoid personal or family events from intruding upon work life. I acknowledge that this shouldn’t be so, but we are only human, and it does. The cause of my melancholy is the decision of the CoE’s General Synod not to approve women bishops. As someone who has been a loyal member of the CoE for 60 of my 63 years (save 3 years at the LSE when I didn’t darken the door of a church) I am absolutely appalled. Most of you will find it baffling that anyone (me) should care so much, but I do, and it goes to the heart of my being. End of venting! On the work front, the “Young Surrey – strategic review 2012/13” continues to be well – received. It is currently being colour printed at County Hall on a pro bono basis by the Chairman and Lord Lieutenant’s office. It is of course on our website. On Monday I was in Haslemere for the launch of the “Surrey’s Young Superstars” awards being sponsored by a Guildford law firm and a local travel company to publicise Surrey’s Air Ambulance service. We had the same intention of securing business sponsors for youth awards, but have been beaten to it by about two months, and will now give support to this venture. On Wednesday I chaired the morning session of the West Sussex Council for Voluntary Youth Services’ annual conference, and made some very useful contacts. WSCYS is our sister organisation with whom we are about to sign a Memorandum of Understanding about collaborative work. Other events have happened this week to develop key projects which I can mention later once further advanced – all are very good. We had our AGM this week at Guildford FE College (partner members) who both hosted us and contributed the refreshments. It went well with a '5 minute shout-out' by 4 member organisations about their work followed up a break out session and then two excellent presentations from funding advisers. We also launched our “Young Surrey – strategic review 2012” at the AGM. This highlights issues of homelessness, mental health and youth unemployment, and is being well received. 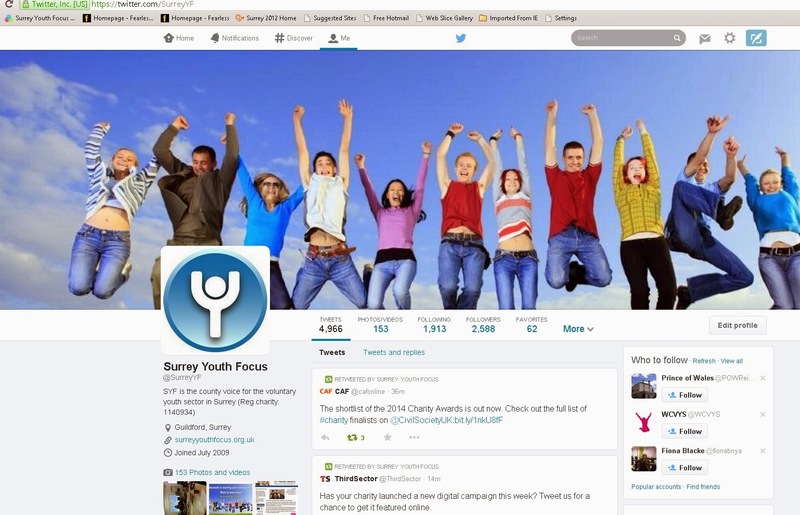 I have been invited to the launch on 27 Nov.of a Surrey CC homelessness service for young people. We are hoping that copies of the Strategic Review will be printed by a corporate for us, and we will then be sending paper copies to our Patrons, members and stakeholders. Meanwhile all this material can be accessed on our website. We met this week with an Apprenticeship Adviser from Guildford FE College with the aim of us taking on a young Apprentice so that we demonstrate that even a small organisation like us can take on an Apprentice. The Armed Forces Community Covenant bid has now gone in to the MoD with the full support of the Surrey Panel which is very gratifying. Our own Community interest Company (CiC) is being registered at present and we expect to be starting up in January. Meanwhile we are doing the project planning for the first of our Surrey Youth Enterprise workshops (funded by Wates). These are aimed at NEET young people and provide advice and support on how to set up in self-employment and business. Last week, I mentioned that BT Infinity were about to install superfast Broadband – well they came and installed a new router, but failed to make the connection to our server, so initially it didn’t work, so we had to contact our IT support company who then did a good job in making the connections so that it worked. BT’s operative was useless, and the router then installed as standard is inadequate for a small “business” like us, with a server, so the advice is we need a new, bigger router at a cost of £295. BT knew our set up in advance but failed to explain any of this. Not impressed. Meanwhile many of you are asking me for my views as the Alternative England Manager about last week’s win against Fiji ( good points score but England didn’t play that well). Australia tomorrow. England are still weak at 7 (open side flanker which Robson is not – he’s a 6) and at 8(Waldron not good enough). My preference is to coach up Courtney Lawes as an 8 – or quickly promote the Wasps 8. We’ll see – England to win though! Well today is the day when BT should be coming to install our superfast Broadband, so let’s hope it happens! Report next week. We had our AGM last night and launched our “Young Surrey – strategic review 2012” document which identifies issues and trends affecting the voluntary youth sector and young people. The theme is a concern that it may be becoming increasingly difficult for marginalized young people to het back on track- 11% increase in CAMHS referrals in one year, and increases in homelessness, so far as we can judge. There is also a challenge to the sector to do more to help with apprenticeships. It’ll be on our website next week. The AGM was held at Guildford FE College (Partner members). The College’s Deputy – Principal welcomed us and described her very inspirational personal story of being a young teenager from Iran and inadvertently alone in London (because her family was trapped in the Teheran revolution) and how she starting selling fruit and vegetables on the streets, and then from a stall, and then a shop, and eventually ran 8 shops. An inspirational and unexpected story about youth triumphing over adversity. The AGM also featured a 5 minute “shout out” slot for member organisations that worked well, and then excellent presentations from the Big Lottery and an independent fundraising consultant. These will also be up on the website next week. I met with various colleagues in the military this week to improve and tweak our Armed Forces Community Covenant bid before its final submission to the MoD next week. The bid is strongly supported by the Surrey Panel but is decided by the MoD. Fingers crossed. Also had an excellent meeting with the Principal of NESCOT (FE College, Epsom – “Surrey Connects Youth Enterprise and Employability Working Group”) at which we have identified various actions to which we are contributing because of our work on social enterprise. Finally, a reminder that the international rugby starts on Saturday (England v. Fiji). I regret to say that as the Alternative England Manager several of the team selections are wrong, and I predict a disappointing, albeit winning performance. I await the call to be the Manager…..
It’s been a tricky week thus far – trying to finish the Strategic Review now named “Young Surrey- strategic review 2012” which is a good title as we expect to produce these on annual basis. The dominant issues that emerge are homelessness and mental health in the widest sense. I am hearing that at different youth centres 80-100% of young people are regularly taking drugs. At the same time we in the voluntary sector seem to be missing out on taking on young people as apprentices. (Net cost to take on a 16-18 year old is £2,500) We are launching the strategic review at our AGM next Thursday evening (8 Nov ) at Guildford FE College starting at 6.00pm with refreshments. We have kept the procedural bit to the minimum. The Surrey Army Forces Community Covenant Panel gave full support yesterday to our £93,000 bid to the MoD to expand the number of military and civilian cadets and leaders. However there are a couple of amendments to make before it goes to the MoD and this will necessitate 3 more one to one meetings, so everything is a slog. I met with a member organisation on Monday who have reshaped their business to the hard times, and done some re-focusing successfully. I had a great meeting with Guildford Diocese yesterday and we will be doing some development work together about pastoral care/ spirituality / values (NOT religion) so that we arrive at a project proposal for colleagues to deliver to schools. It will take a while to shape this up, but it could be an exciting proposition if we can market it to schools. Finally this afternoon we should be finalising the directorships for the new CiC providing jobs and training to young people. And then… youngest son’s wedding..about which there will be a full report next week…better than HELLO magazine, as a taster - my top songs for disco (in London) – “Werewolf of London”, and AC/DC “Thunderstruck”!! Rock on!